This inner porch in varnished oak set off with gilding is the work of the sculptor Laurent Delvaux and is surmounted by statues representing the virtues of Fortitude and Prudence. 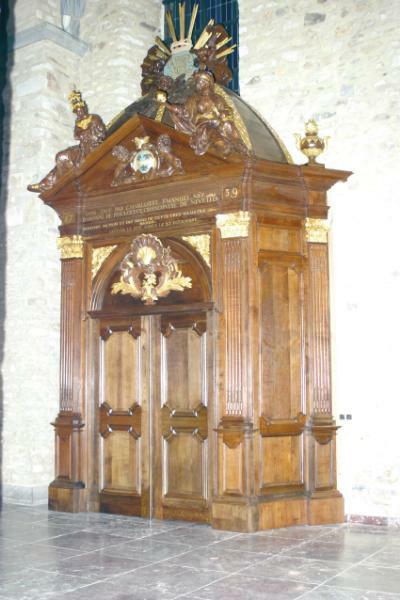 It was donated in 1739 by the Canoness Charlotte Emmanuelle de Poelgeest, restored (City of Nivelles, Christian Patriarche) and re-installed in 2004. 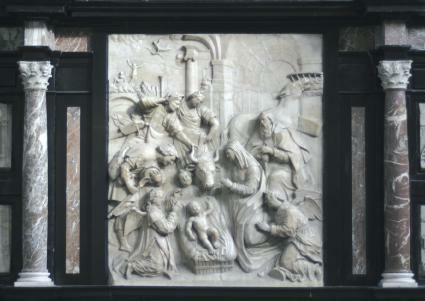 The marble and alabaster altarpiece dating from 1623 is the work of the artist Jean Thonon of Dinant. It is currently set into a baroque surround which was formerly the housing of an organ. Originally placed in the eastern choir, the altarpiece was moved to its current location when the choir was restored at the beginning of the 20th century. It comprises nine alabaster bas-reliefs, including the Adoration of the Shepherds and legendary episodes from the life of Saint Gertrude. 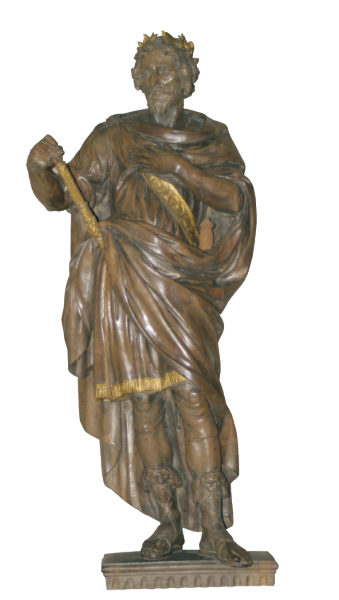 Saint Peter, both now exhibited in the Imperial Room. In the mid 11th century, the relics of Saint Gertrude were removed from the tomb in the Church of Saint Peter, the foundations of which can be seen today in the archaeological basement. 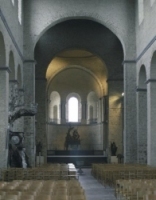 During the consecration ceremony of the Collégiale in 1046, a shrine containing the relics was placed here near the high altar, where it became the focal point of the cult of Saint Gertrude. 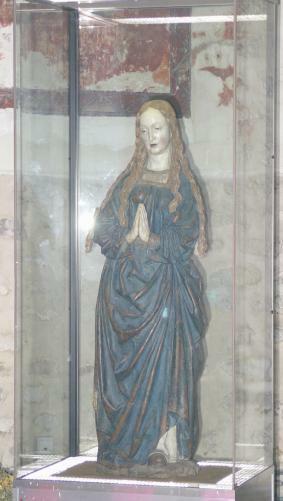 In later times the shrine was enclosed in the brass case (16th century) mounted on a support, or aedicula, in blue stone. 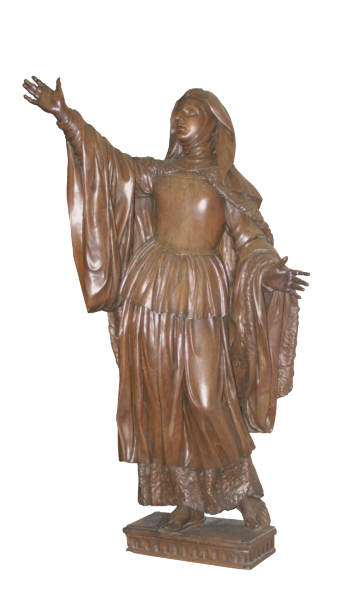 This exceptional statue of the young Virgin Mary, represented with uncovered head and joined hands, is by an unknown sculptor, probably one of the masters active in the last years of the 15th century in the immediate entourage of Jean Borman. This contemporary shrine (1982) which contains the relics of Saint Gertrude is the work of the artist Félix Roulin. It replaces the Gothic shrine of 1298 which was destroyed in the fire of 14 May 1940. Made in stainless steel, it is decorated with silver and bronze and is composed of a central case that contains the relics and four volumes which transform the general appearance of the shrine according to its use. The shrine, with its 36 panels in solid silver, is placed on a cart for the annual procession known as the “Tour Ste Gertrude”. 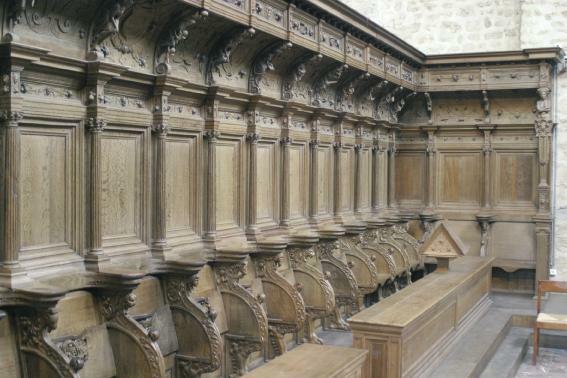 The Renaissance stalls date from 1566 and consist of 32 oak seats for the canonesses who attended the religious services in the Ladies Choir. The decorative elements are taken from the pagan repertory of the time. These choir-stalls were removed when the Chapter was suppressed at the end of the 18th century, and were subsequently restored and re-fitted by the wood-worker and artist Christian Patriarche. They bear witness to the existence of a religious community here of which Gertrude was the first abbess. 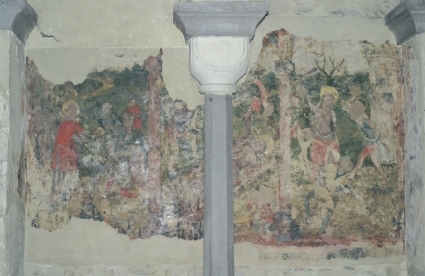 Some of the paintings which used to decorate the plastered walls of the church have been conserved. On the flat chevet of the eastern choir is a fresco from the 14th century repainted in oil in the 16th century and representing the martyrdom of Saint Laurence. Other traces of wall-paintings can be seen in the abbess’s chapel (western transept) and in Saint Gertrude's chapel, situated on the first floor of the westwork. The sculptures by Laurent Delvaux (1696-1778) are the choicest pieces remaining of the decorative art dating from the 18th century in the Collégiale . Born in Ghent, Laurent Delvaux was one of the foremost sculptors of his time and was famous for his subtle way of synthesising the various prevalent artistic trends. 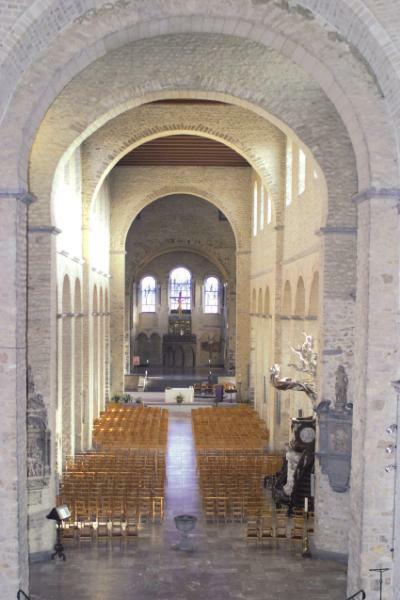 Based in Nivelles, he executed works as sculptor to the court of Charles of Lorraine and religious orders from the Chapter of the Collégiale. 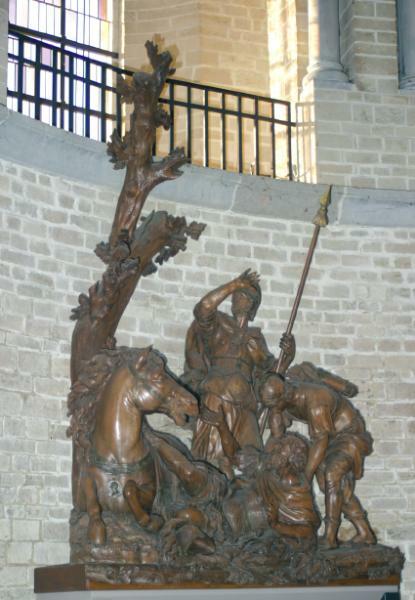 Exhibited in the western transept, these are: the Lamb of the Apocalypse, the Apostles Peter, Andrew, James and Paul and the Conversion of Saint Paul (western choir). These works by Laurent Delvaux represent the first abbess Gertrude (or perhaps her mother, Itte of Aquitaine), and her father, Pippin the Elder, Mayor of the Palace of the King of Austrasia, Dagobert. The saint is represented in a triumphal manner unlike any iconographic anecdote, while her father is dressed like a Roman emperor. These statues stand at the location where construction on the church commenced at the beginning of the 11th century against a previous westwork dating from the 10th century. 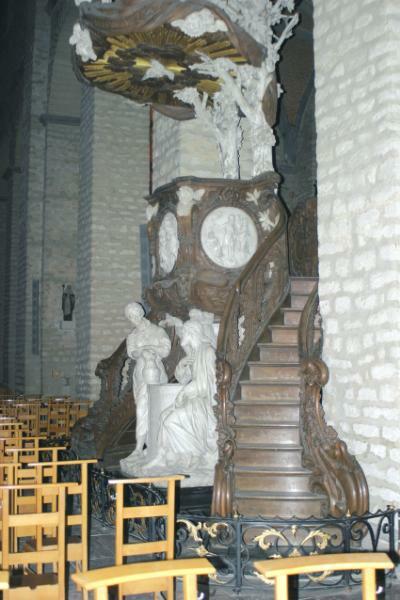 Laurent Delvaux began this pulpit at the age of 74, assisted in the wood carving by Lelièvre, and in the joinery by Bonnet. Delvaux himself sculpted the group representing Jesus and the Samaritan woman, as well as the medallions that represent the Parables of the Sower, the Prodigal Son and the Good Father. The pulpit epitomises the art of Delvaux who, contrasting white marble and varnished wood, harmoniously combines the different movements: Baroque, Rococo, and Neo-classicism. This choir is flanked at mid-height by tribunes that connect the chapels of Saint Gertrude and Saint Agatha and is covered by a cupola more than 14 metres high, ending to the west in a vaulted apse. This choir of the Saviour, which occupies the ground floor of the 12th century westwork, is situated over the vestiges of the original westwork, which dated from the 10th century. 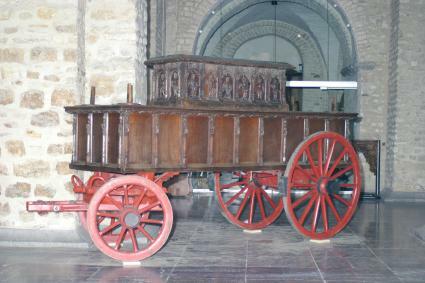 The old parts of the oak cart date from the 15th century. 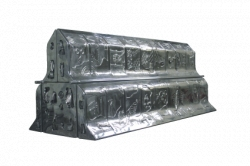 It is used to carry Saint Gertrude's shrine during the annual Tour Saint Gertrude, the origins of which date back to the 13th century at least. This 14-kilometre procession is held on the Sunday after the feast of Saint Michael (29th September), patron saint of the town. The body of the cart was originally adorned with 24 painted panels on a gold background, representing the miracles of Saint Gertrude, the work of Jacop Sourdiaus (student of Rogier van der Weiden) around 1460. Some of these are exhibited in the Imperial Room on the upper floor of the westwork. 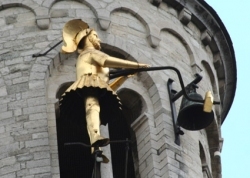 The jaquemart known as Jean de Nivelles hangs near the top of the southern tower which flanks the westwork of the church. This gilded copper figure, which strikes the hour with its hammer, dates from the 15th century. Formerly an ornament of the mediaeval town hall, it was moved to its current location around 1620. It is 2.08 metres tall and weighs 350 kilos.